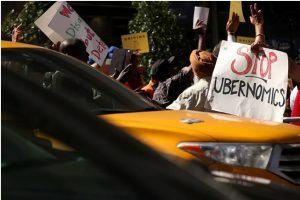 The Pew Research Center published its first study of the scope and impact of the “shared, collaborative, and on-demand economy” earlier this year. We often read of the dramatic impact these business models are having on incumbents, but it is clear from the demographics they still have a lot of ‘disrupting’ to do. Among the 4,787 American adults surveyed, only 15% had used ride-hailing apps such as Uber or Lyft, only 11% had used home-sharing services such as Airbnb and 59% of Americans had never used same day or expedited delivery service such as GrubHub or Amazon Prime. In fact, 28% of adults hadn’t used any of the described services. I know my use of these platforms is not representative of the broader population – Uber 6-8 times a week & Airbnb 15-20 times a year – but I found it startling to learn just how atypical it is. More interesting, perhaps, are the implications for the segment growth which largely correlate to age demographics. If the trend continues, we should call it what it is. This isn’t merely disruption; this signifies the early stage destruction of many old world industries. I, for one, welcome it, but many do not share this opinion. As “shared, collaborative, and on-demand” services grow, we will undoubtedly hear of similar protests in other industries. I’d like to think there is a world in which many of these old and new world services may peacefully coexist, but if history serves as an indicator, consumer preference in these multi-sided markets will eventually select one as the victor.